Hey lil darlins:) So the hairstyle that I get the most requests for out of them all (probably because its always how I have my hair*wink*) is my undone bun! Now there are two different ways I do this, but this version is easier to photograph and to explain, so I thought I'd share it first! What do you think? The thing I love best about this style is of course the ease and simplicity, but also the way it can be so casual with the messy approach, but if you don't tug out your flyaways it can really be quite polished and fancy! I think it would work great for curly hair as well because it would be even more forgiving, and it would work for medium to medium-short length hair as-well! Lets get to it shall we? Step #2: ...stop! once you get your fits through the hairtie (stilkl holding all the hair) twist the hairtie and create a funny samurai topknot high on your head! 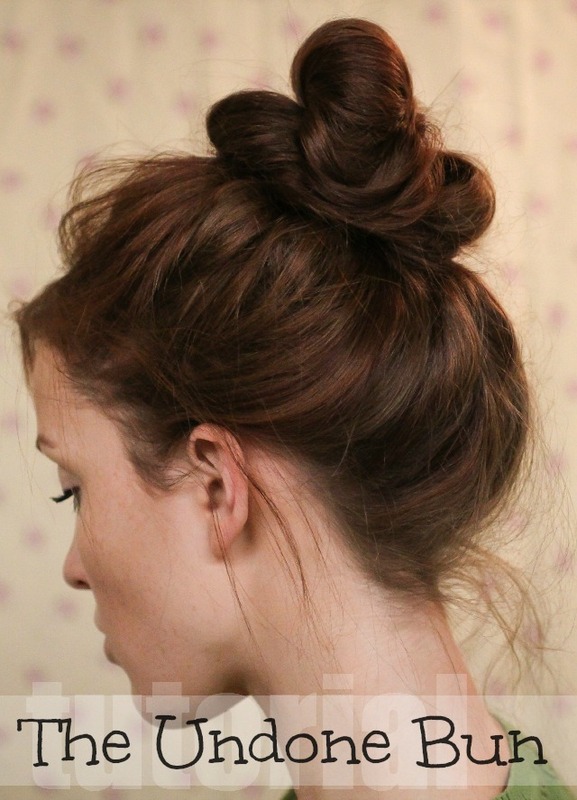 holding your topknot with one hand tud your hair out a bit in all directions to give volume. Twist the remaining hair and begin to wind around the topknot! Step #3: coming from the back to the front, so as to make sure the ends get back around. 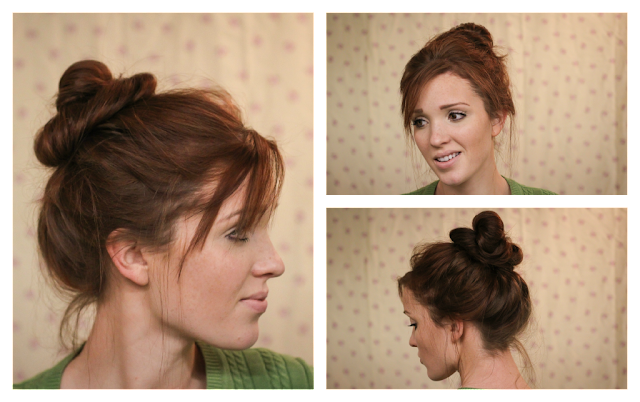 Secure your new bun in several places with your pins, and spritze with some hairspray! Congrats girly, you're done! I've done this style so many times I can do it with my eyes closed, but it really has only ever taken me about a minute to achieve! 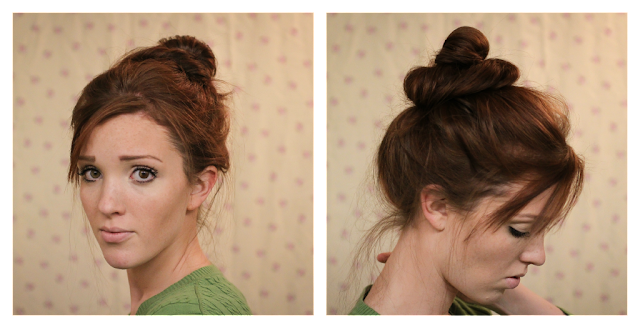 Its my go-to topknot bun, and I hope you will love it as much as I do! I hope you give it a try and then come back and tell me how it went. I'm always looking for feedback on my tutorials, so as to make them as clear and helpful as possible, so feel free! Love it! Super simple and still pretty! Love this! Your hair looks adorable! I adore this look! Absolutely LOVE it! I wish my hair was a little longer so I could do this. Thanks for the love btw! love. I'm a self-proclaimed bun head myself. plus they fit nicely in my hard hat opposed to a regular pony. Super cute and looks so easy. I am definitely going to try this. I love learning new ways to do my hair up since it is super thick and long. This is going to be perfect. I'm a huge fan of this look! and I always love how you lay out your tutorials! thanks for this great post, have been desperate to find a new way to do the bun, I live in the humidity and my hair is always up because it's so hot, it gets boring though so I will definitely try this. I am in love with your blog, you are gorgeous. Love this! So simple but elegant! Wow, love this. I must say, I discovered your blog yesterday and already am using several things from it :) This is really cute and useful, especially since i've been struggling with making my crappy hair into a nice looseish messy bun, and always something wasn't working. This time it all fell perfectly into place, so thank's for that great tutorial!